Vyrn's very own gearcycle, fashioned for him from scrap materials by his squad, the Red Wings. Big dog Tsubasa's taste shines through in the design—this is one hella dope ride. 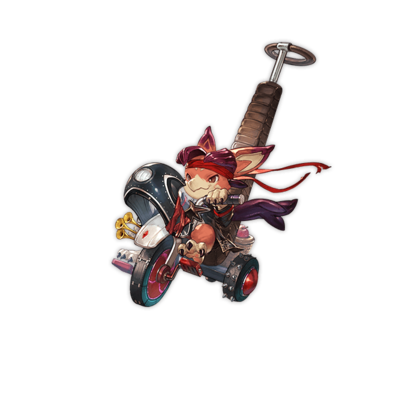 On this beast, Vyrn will tear up the road all the way to the other side of the sky. The 250% damage is based on the ATK of the Main Character. シャー！　出発だぜコラァ！　テメェら気合入れてけ！ Zoom! Hey, we're leavin'! You all get ready to rumble! オイラも、蒼空の向こう側に、行ってやるんだ I'mma gonna go to the other side of the sky too! オイラが“ドウイング”の新入りビィだぜぇ、夜露死苦！ I'm Vyrn, a Red Wings rookie! Pleased to meet ya! This page was last modified on 15 April 2019, at 03:55.